Satoshi Circle Review: Spin that Wheel and Grab the Rewards! 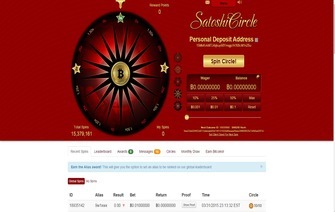 The Satoshi Circle is one of a number of single game casinos that offer under the Bitcoin currency. The game is based around a single wheel that includes some stunning graphics to accompany it; more of which we will discuss later in the review. The site comes on the back of an already solid reputation and has quickly emerged as one of the leading Bitcoin casino games in the industry. That being said we are still going into this review with an open mind and feel the need to stress that any word on previous reputation will be pushed to one side. The inclusion of single game casinos seems to be very much the Bitcoin way at the minute with more of these forms than say the better known casino that includes hundreds of games. But it’s the Bitcoin payment that allows companies to do this so easily and it also means that they can work as hard as possible in perfecting just a single game. Early impressions of the Satoshi Circle game would certainly back that up, but as we dive deeper into this review, hopefully we will be able to shed a little more light into why it’s been so popular in the industry so far. There’s no sign up bonus as such at Satoshi Poker but players will be able to start earning from their first spin of the wheel. A list of 18 awards is available at the site and they can be cleared by reaching a certain amount of spins either in a day, week or month. They start pretty simply with the Alias award of spinning the wheel ten times. Once this is done then you will be able to assign an alias to your account. It then works its way up through to things such as 5 BTC wagered 3 spin win streak, 9 spin win streak, 5 spin lose streak before reaching the top at 15x circle award for players who have managed to rack up over 500,000 points lifetime. The points will mean you can unlock a host of prizes from the Satoshi store. But, this store isn’t actually available yet, at the time of writing, anyway. We are informed that it will be along very soon and all points accumulated before the store opens will be eligible to use in the store. Points also mean that you can unlock a series of multiplier tables, of which we will talk about more in the next section of this review. As you will be aware, Satoshi Circle is one game casino that revolves – no pun intended- around a wheel. This wheel includes a series of multipliers for your bet amount and if you land on one your stake will be multiplied by that number as your winnings. If you fail to land on a multiplier then you will lose your original stake. The game starts to get interesting as you start progressing through the many awards levels and unlocking the 5 possible tables. When you start you will be given the option of two tables that are the 3x and 50/50 circles. The 3x circle includes a maximum pay-out of 3x your stake and also multiples of 2.0x, 1.5x, 1.2x, and 0.25x. The 50/50 table is simply a 2x pay-out or a 0 pay-out with a single section of .70x thrown in for good measure. The tables then work their way up to 5x, 10x and 15x maximum pay-outs for each spin. They all include a smattering of lower pay-outs ranging from zero up to 2x. It is worth noting that all tables include the same house odds of 1.76% of which Satoshi are very proud to advertise. If you think that a roulette table has odds of 5.26% then this actually works out a very good value. You can change how much you want to wager for each spin as well. These range from 10%, 25%, 50% or max bet. Bear in mind that the max spin is 0.25 BTC at any one time. This does limit the amount in which you win, but Satoshi Circle claim that this was the most common highest amount people were wagering during their Beta testing phase. Whether this should make a difference will depend on personal preference, but we can see it being more than enough for the majority of players. There is no need to register an account so you will be given a unique deposit address every time you load up the webpage. It’s probably worth bookmarking the home page once you land on it, just for future reference more than anything. Depositing is instant but withdrawals will require two confirmations before you can access your money. This is basically because accounts aren’t needed, so they have to have an added layer of security for funds and this is how they choose to go about this. In all honest, we would rather this than instant as it at least ensures your money is going to be safe for the wait of just a couple of extra hours. Support options include an email address and also a live thread on the BitTalk forums. Response time seems pretty solid and we found that the process was a pretty painless one with the answer to our query being comprehensive. We have also heard positive reports about posting in the forum and it might be worth giving this a go if you will be looking to interact with the support staff a little more. Due to it being on an open forum they are generally a little keener to resolve situations than if they were behind closed doors. The addition of so many different tables has to be the standout feature for Satoshi Circle in our opinion. We love the way you have to work your way up through the ranks to get to the bigger paydays and it kind of gives you a sense of achievement when you make it to the next level. That’s if you avoid bottoming out though! One thing you should keep in mind is regarding the provable gaming they provide. At anytime you can add a seed to the next spin so you know your getting a fair handshake during each spin. It’s also good to have the leader boards on show as well to not only track your progress, but that of others. Watching to see how much the high rollers win or lose can be a little bit sickening, but it’s great fun even if it’s just monopoly money to you or I. Finally, the site just looks Great! It’s so simple and we love this. The inclusion of dark reds, blacks and gold’s for the game itself is really good looking, but then when you need to view information such as FAQs or track leader boards it’s in a much simpler white background with black text for maximum readability. We already knew how popular this game had become before heading into this review, but we tried desperately to not let this cloud our judgement. However, we can absolutely see why so many people have already played the site –over 10 million spins at time of writing – in such a short period of time. It looks probably like the most polished and professional standalone Bitcoin casino game we have come across which absolutely adds to the experience for us. We won’t be a single bit surprised to see Satoshi Circle go on to be a real powerhouse in the industry and kick on as one of the biggest Bitcoin games in the market. Bonus The more you play the more reward points you get. Reward points can be used to unlock special features as well as buy things from the store!